A family caregiver puts so much thought and effort in to caring for a loved one. Caregiving is much more than handing out medicine and preparing meals. It is a truly selfless act on behalf of another human being. One of the most difficult aspects of caring for someone who has limited movement is getting them comfortable in bed; at least it is for me. When I lie down at night, I know it takes a few moves here and there just to find that right position of comfort that allows me to settle in to sleep—that sweet spot. However, when you are responsible for helping someone else find their “sweet spot,” you don’t have the benefit of “feeling” for just that right point of pressure and relaxation; so how do you help them get comfortable? Here are some things I do to help Lynn be as comfortable as possible in bed. Is Assisted Living or a Continuum of Care Right for Your Loved One? Assisted living—typically includes housing, medical care and meals for older adults—is expensive, starting at about $36,000 a year and going up in cost from there. While there is a variety of options, ranging from facilities with memory care wings focused on dementia care to those with income requirements to others that are high end and upscale, none focus on the participant’s continuum of care, an integrated system of providing care over time. 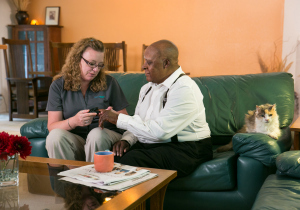 Families often believe assisted living will be a single source for all health services. However the essential services provided by assisted living facilities is very basic. Staff ensures participants eat well and take medication. Assisted living facilities focus inward; outside the walls of the facility is less of a concern.